Bigger heatsink & cpu fan? I love the RockPi4, but it seems like the heatsink is a bit undersized. Also, is there a place to plug a cpu fan in to the board? I’ve been looking for schematic and pin-outs but am not having any luck. As for heatsink there is already gian heatsink (i still prefer small one with fan. As for fan, you need 5V fan (i only was able to found Noctua A4x10 or A12x25, google “Noctua 5V”). Connect him V to 5V output on GPIO and ground to Ground on GPIO. I recommend 60 mm case fans, which are also available with 5V power supply as an exception. There is a company that supplies fans with some adapters for adaptation to the respective conditions. Actually these are 4 wire PWM fans, but they also work with only 2 connected wires. Then you can’t measure the speed, but with 2 wires it is at maximum, so 3000 rpm. However, the fans are almost inaudible. I would also recommend a dust filter. If a 5V fan is used, the adjustments to the 12V are omitted, which simplifies the circuit. Only the pull ups against 5V and a diode are needed. I use cheap Arduino Pro Micro (ATmega32U4), from China. The 25kHz I create after an example by Edgar Bonet. He has released the short program on StackExchange in response. Set PWM frequency to 25 kHz It’s the code in the second response. // PWM output @ 25 kHz, only on pins 9 and 10. The photo shows a test setup with a Leonardo powered via USB from the Raspberry 3 B+, which is also to be cooled. The housing is made of aluminium and also serves as a passive cooler, which is sufficient up to 3 B, but no longer for the 3 B+. Just so I understand, You want the “Big Giant Heatsink” to be bigger? You have the small one and are not aware of the “Big Giant Heatsink”? but I need something more powerful and more capable. i.e. M.2 disk drive, USB 3.0 + 2.0 with a fast powerful processor, and can run indefinitely without overheating. Can I just plug a fan into a header? I can with RockPro64 (which has available a couple larger heatsinks ). I like the rockPi4 It’s small and compact ( even with the M.2 expansion board ), it runs ubuntu 18.x and the development is active. It can fit into a small case, if there were a cpu fan header and the heat sink were slightly larger, it would be the board of choice. …a small 5V RPi fan is working on my Rock Pi 4, which was plugged directly to the 5V of the GPIO for a test. As the source voltage of USB QC/PD is variable, there must be a voltage converter for 5V between source and GPIO in my opinion. I’m also not sure, what’s the max. rated current. It would be good to know, if somebody could share this info? 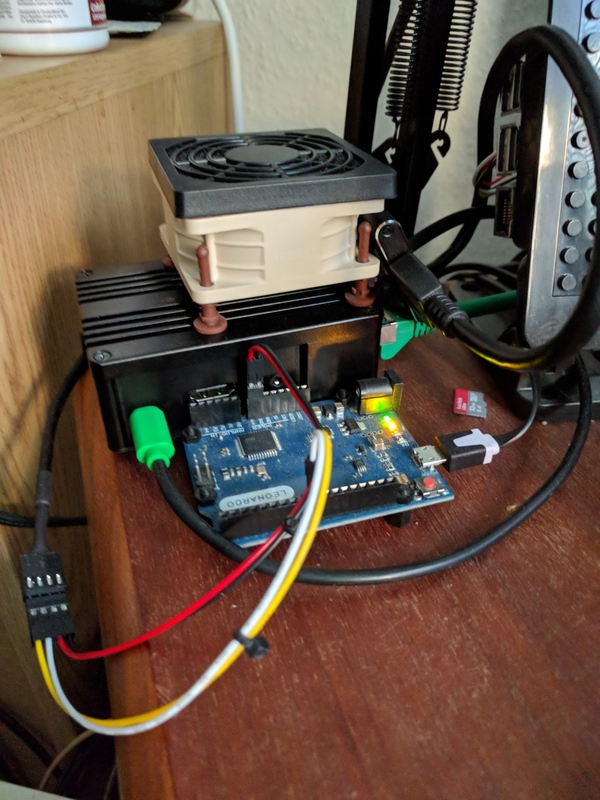 I’m currently running the rock pi 4 with the big heatsink without fan. It’s good so far, but it can get really hot, if you have a high CPU/GPU load for a longer time. What I was suprised is, that the small heatsink (delivered with default case), combined with a very small RPi fan (30x30mm), was enough, that the small heatsink never got hot, not even warm. As a result of my own tests, a small 5V fan brings maybe more, as a large heatsink. This has to be verfied in benchmarks for sure, which I have not done so far. As an indication i can say: PSP emulation runs good with large heatsink without fan, as well as with small heatsink with fan. With small heatsink without fan, it runs very slow. So question is, what is really necessary for optimum cooling? I don’t think, that’s really necessary to work with PC cooling components, because the thermal power is about 6W, acc. to datasheet from Rockchip. I think the desire for a large heatsink instead of a fan is only due to the noise a fan can make. I can well understand that. When I started working with computers in the early 80s, all home and office computers worked without fans. When with the advent of the affordable IBM Compatible PCs, fans became the standard, I found it creepy.